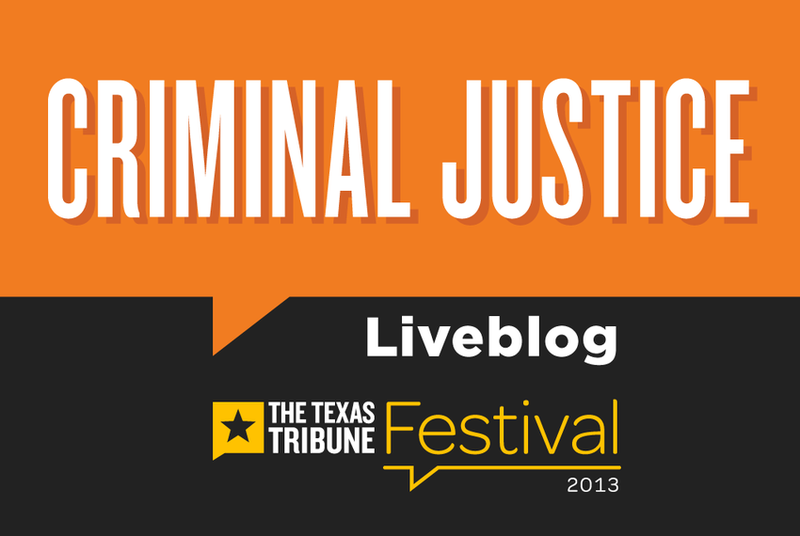 We're liveblogging this weekend from The Texas Tribune Festival's Criminal Justice track, which includes panels on guilt and innocence, juvenile justice, guns, and a one-on-one conversation with Attorney General Greg Abbott. Featured speakers include Innocence Project co-founder Barry Scheck, state Sens. Brian Birdwell, Rodney Ellis and Royce West, and Land Commissioner Jerry Patterson. Follow us here for updates from the University of Texas at Austin campus. Grissom is introducing the panelists: Sen. Rodney Ellis; Wallace Jefferson, chief justice of the Texas Supreme Court; Sarah Kerrigan, vice chairwoman of the Texas Forensic Science Commission; Vikrant Reddy, policy analyst for the Center for Effective Justice; and Barry Scheck, co-founder of The Innocence Project. First topic will be wrongful convictions and exonerations. The Innocence Project has sent a letter to Gov. Rick Perry asking for an investigation into the Cameron Todd Willingham case. Willingham was convicted of setting a fire that killed his three daughters. He was sentenced to death and executed in 2004. An investigation later found that the fire science used in the case was flawed. Scheck is talking about how bad forensic science and negligence leads to wrong convictions. The Forensic Science Commission found that testimony in the Willingham case was wrong and voluntary decided there was a duty to correct similar cases. "All these systems are doing what government should do," Scheck said of the commission's role in correcting cases that might have wrongfully convicted an individual. Scheck is talking about the "total system failure" surrounding the Willingham case. Scheck compares the case to that of Michael Morton, who was wrongfully convicted and served almost 25 years in jail before being exonerated. "What we really need is an all stakeholders review," Scheck said. Kerrigan is now talking about the challenges of forensic science. She said the commission encourages the advancement of forensic science but discourages the use of outdated techniques. "It's imperative that the science is put to the test before it's put to the court," Kerrigan said. "I would say it needs to not be political," Jefferson said. "We need to look at this from a statewide perspective and be sure there aren't people sitting in jail who are innocent." Jefferson calls for politicians to leave partisanship behind and look for solutions that will prevent an "innocent person from rotting in jail." He says judges must take a more active role in starting the conversation and bringing political leaders to the table. Reddy is now talking about the attitudes toward prosecutors and "the adversarial nature of the system" that surrounds the prosecutorial community. He says the state must find a way to improve these attitudes and continue to push for liberty in criminal justice. Ellis acknowledges the importance of an ongoing review of the criminal justice system. "Our criminal justice system is a government program," Ellis said. "We screw up sometimes." Ellis said some changes have been made. Families couldn't be compensated posthumously before, so his staff worked with the state attorney general's office to change this, he said. He closes by saying it's importance to clear up mistakes but make sure "we don't screw it up again." The conversation now moves into criminal justice reform and what can be done to improve the system. Reddy says he’d like to see more conversation and a cultural shift surrounding criminal justice. Kerrigan says the state is moving in the right direction working with stakeholders to improve the role and work of the Texas Forensic Science Commission. "It's a really tough time to be in forensic science," Kerrigan said. "We are still chasing down demons of the past." She says forensic scientists are trying to make a difference by telling the truth with science, but this comes with challenges, including underfunded labs. Jefferson agrees and calls for appropriations from the Legislature for programs that leads to a better criminal justice system, including law schools. "If we put these things in place, we will have a much better chance of solving these problems," Jefferson said. "We can be doing better than we're doing." Scheck says he agrees with the other panelists and calls for more transparency, including public hearings. "You can have a board of pardon paroles who are just faxing each other," Scheck said. The system needs higher standards of transparency and for "changing the criminal justice infrastructure with technology," Scheck said. He calls for online databases for real information-sharing. "If we can get these things done in New York, Texas and California, we can change all of the country," Scheck said. Ellis jokes that it's nice to be able to say in New York, "Hey they passed this in Texas." He says the state can improve the system and says that "it's nuts" that judges pick public defenders for poor individuals. The Q&A portion of the panel has begun. First question is over who watches over prisons that are looking to meet quotas. Reddy says it's a dirty business and emphasized transparency. Second question is about reducing prosecutorial discretion, specifically in regard to plea bargaining. Ellis says he hasn't heard about any conversations, but he emphasizes transparency so the information is public. Scheck says accountability and disclosure should be part of every case and talks about the importance of integrity commissions. Third question is about collecting and maintaining trial evidence. Scheck talks about the importance of preserving evidence, including original interviews. Ellis says that it's more than "just being right" and that providing accurate information is more important. "On the broader level, we all have a role to play," Ellis said. Kerrigan says it's important to "protect and insulate" scientists in forensic science labs and help them remain independent from law enforcement. Last question is about evaluation of prosecutors. Scheck says a good rule is distinguishing between negligence and misconduct within institutions and providing a forum to discuss these. Ellis says it's also part of the election process and asking more from candidates. "I haven't seen anyone running saying, 'I'm fair'," Ellis said. Q&A is over. Grissom thanks the crowd for their questions, and that's it for the "Guilt and Innocence panel." Fun facts: Born in Wichita Falls, Greg Abbott is the longest-serving AG in Texas history. Abbott says he has gotten close to 40 percent of Hispanic vote. If you drill down into electoral stats, Hispanics identify with conservatives, Abbott says. He says Hispanic tendency to vote Democrat is issue of "branding." Abbott says he has helped Republican Latinos get elected. Says there is an "ongoing, unprecedented outreach program" to get more Hispanics voting GOP. Abbott: It is now safe for Hispanic members to run for and get elected as Republicans. Said argument that Hispanics hurt by Spanish surnames in GOP primaries has proved to be false. About the finding by a D.C. court that there was intentional racial discrimination, Abbott says: "There is no racial discrimination in the lines." Continuing conversation about redistricting, Abbott says: "I can't guarantee what's going to happen in the lower court." Ramsey notes that voter participation in Texas is quite low, in the context of a conversation about voting rights laws. Abbott quips with a laugh: "That's race-neutral"
Abbott compares the pre-clearance provision of the Voting Rights Act to a "Mother may I" approach. He also says that under the law as it exists now, after the Supreme Court decision on the Voting Rights Act, there are "active, easy legal remedies in place" to combat discrimination or violations of rights. Will voter ID law be in place for 2014 primaries? Abbott says it would be hard for courts to issue an injunction against it before March. Abbott says there are "far more incidences of voter fraud" than incidences of people losing right to vote. Regarding voter ID, Abbott says "some people seem to have short memories." He brings up the 2000 Bush v. Gore battle. He also says Al Franken won his Senate seat in Minnesota thanks to illegal voters. Notes that Franken cast a decisive vote in favor of the Affordable Care Act and thus, "without voter fraud, Obamacare would not exist." Abbott says that even with Section 5 gone, the Voting Rights Act and the U.S. Constitution remain. He says voting rights are still protected. Abbott is asked by member of the audience how a 20-week abortion ban is constitutional because the Supreme Court says it's legal up to 24 weeks. He notes that there are lawsuits on the new restrictions, and he says the Supreme Court will determine if they are legal. Asked about decision to fight the American Airlines merger with US Airways, Abbott says "certain components" of it violate antitrust law. Abbott, in response to a audience question, says there is no evidence showing that voter ID laws suppress voting. Question to Abbott: Would you support online voter registration in Texas? He says he's okay with it if it's secure. Says he doesn't have the data one way or the other. Asked how low-income Texans can get affordable health care, Abbott says wants "more access to better care for more Texans." He says under Obamacare situation will be worse. Says he believes Texans can come up with its own model. Says reforms should include sale of insurance across state lines, better portability of insurance policies and larger pools of insured people. Also advocates for block grant from federal government to handle Medicaid. Now starting: Juvenile Justice: What Now? Grissom opens the discussion by asking about ticketing in Bryan ISD. Fowler says her agency, Texas Appleseed, filed a complaint in February. Two offenses accounted for more than half of all tickets being issued, and African-American students were very overrepresented in the tickets. She says it's very prevalent in all campuses across Texas. "The mechanism has changed," she says. "School is one of the first opportunities that we have to intervene," she says. "What we know now is actually putting children into contact with court systems is counterproductive." Reasons include an increased likelihood of dropping out of school. Griffiths adds, "It's counter intuitive to what those young people need." Fowler says that whether you believe in ticketing children or not, the question is whether what we're doing is counterproductive. Moody adds in, "The message you're sending to a child is that you are a criminal." He cites alternative programs that have helped students avoid the juvenile justice system, saying they've had in the neighborhood of 90 percent success rates. Grissom raises the topic of mental health as a factor in the juvenile justice system. Rose says there's a framework in place for schools to look at appropriate behavior for students. It helps to set up a formula for identifying mental health concerns. Fowler says the reason everybody focuses schools as the place for initial intervention "because it's more effective and that's where kids are for a good part of the day." Grissom asks whether schools have the resources to identify these problems and fix them. Fowler answers, they already have the legal obligation to identify. "The question," she says, "is whether they have the resources once they're identified." She says there is often a lack of district-wide awareness of programs that are already in existence to help students. "It's often surprising to see what's already in place in the school system that isn't effectively utilized," she says. Some of the most effective programs in place require students to be sent first to truancy court before they can access them, she says. Grissom asks Griffiths about what processes TJJD is putting in place to deal with mental health issues. Griffiths says, in the meantime, while his recommendations are being reviewed, is bringing in stakeholders. "We know that that system was not designed for some of these youth," he says. "Nonetheless, they're in our custody now, and we have to do the best we can." Fowler adds that she was surprised to see kids at Corsicana who should never have been adjudicated in the first place. "There are systemic failures, not just at the mental health level, but ones the kids touch the system as well," she says. Griffiths responds about the need of a "diversion model" as the ideal system to get mentally ill kids out of state facilities. Griffiths maintains that he is still hopeful, and says the current trends are very encouraging. Rose speaks to the importance of fully funding and prioritizing early intervention programs to keep kids out of the system in the first place. Fowler worries that current trends of cutting funding will leave county facilities unable to do a good job. Moody says, "Having things in the community is definitely beneficial," and that it forces legislators to confront how to solve the problem. Grissom notes the problem of resources. "Do you see an appetite going forward?" she asks. Moody says yes, but that Texas still hasn't come close to addressing the real needs. He cites Texas' low national rankings in juvenile justice. "The issue doesn't go away. ... It costs you more down the road," he says. Grissom discusses Miller v. Alabama in 2012 decision that life without parole for those under 18 is unconstitutional. In Texas, adults are considered to be 17 and up, which puts the state in an awkward position, because there is a question about what to do with capital cases for 17-year-olds. Moody says the solution to treat 17-year-olds like 16 and 15-year-olds was "a patchwork solution." But, "during the debate," he says, "we had a broad policy debate about what to do with juveniles." He thinks the discussion will continue into the next legislative session. Rose stresses the necessary to provide a sentencing range for minors. She discusses the example of a juvenile charged with capital murder for robbery-homicide. In a case like this, she says, the youth should be held less culpable for his crime, according to the Supreme Court, but isn't. "We need to look at whether we're locking away kids for life," she says. Moody stresses that, under the current Texas system, 17-year-olds are definitionally adults. He says for every example Rose cites, there's a difficult counterexample about determining who is more culpable. "We're talking about very, very violent crimes," he says, and says his jurisprudence committee deliberated the issue for hours. Grissom raises Supreme Court language about neurological differences between juveniles and adults. Rose stresses that most crimes in question are actually far less violent than the examples cited. "Not only are they less culpable," she says, "but they're more susceptible to rehabilitation." Fowler points out "the irony in Texas that we treat 17-year-olds as adults, but we treat all children as adult in the lowest level offenses." Grissom asks for recommendations to legislators. "What would your ideal look like?" she asks. Rose says a logical first step would be to raise the age at which a person is considered an adult at age 18. Fowler points out, even raising it to 18 is still contrary to the science, which reports it should be higher. Moody says he thinks doing such a thing is politically unfeasible. "Earlier on in life, the focus in criminal justice should be to re-integrate," he says. He points out that what's missing from the panel discussion so far is criminal record. Arrests can follow people later in life, especially in their job searches, he says. Griffiths says, "There's an ancillary problem of resource and capacity." He says the legislature needs to be mindful that the burden to expand would fall on the local tax dollar. Audience question is about identifying mental illness in children. Rose says, "The most important thing is we provide the schools the resources." That means increased funding and flexibility, she says. Fowler says schools do need more resources, but she stresses the importance of schools working collaboratively, citing examples from DISD in which the administration was unaware of programs already in place. "Part of the process is mapping what's already out there so you know where the gaps are," she says. A second audience question asks whether there are any programs that wipe juvenile records clean after rehabilitation. Griffiths says there are. "Those can be replicated even farther," he says. Moody says, "The goal should be to rehabilitate to the best that we can, but wiping out the record is an important component." He says that aspect needs to be addressed in the adult justice system as well. If you successfully complete a rehabilitation program, he says, "the reward should be that you get to start from zero." Griffiths says parents can be part of the solution at least as much as they can be a part of the problem. Last audience question asks what peers of juvenile offenders can do to help. Griffiths touts the value of "teen courts," and says he would love to see that model replicated and expanded. Fowler says she advocates teen court programs that are school based, because the child doesn't end up with a criminal record after going through the process. She also recommends a model called "restorative justice, which ensures that the so-called offender, the student, understands what the harm is to the school community or to the victim." Grissom wraps up the panel. Next up: guns! Root notes that everybody on the panel has expressed support for the notion of personal handgun ownership. But he asks if any of them have had any negative experiences with guns. Patterson says he's had an accidental discharge. Villalba says his gun use is limited to the range and hunting, and so can't say he's had a personal situation. Birdwell says he's never had a negative experience. "Run out of bullets," says Rodriguez. Carusone talks about ringing in her ears. Patterson says he and others have a right to own weapons commonly held by the people. He says this doesn't extend to fully automatic weapons, since they are not normal weapons for the people to have. But, he says that should apply to semi-automatic weapons. Rodriguez says an AK-47 is not a weapon typically used by a common person. Patterson disagrees. Root says that Gov. Rick Perry has said guns should be allowed everywhere and asks where guns should not be allowed. Patterson says bars should be off-limits. Birdwell says in justice settings, such as courthouses. Birdwell says he dislikes that discussion over types of weapons and where guns should be allowed, indicates that discussions of both nature overlook key 2nd amendment issues. Carusone says focus should be on background checks. Jay asks why universal background checks are violation of 2nd amendment rights. Birdwell says it's not, but he wants to make sure the process protects individuals' rights. Carusone says universal background checks are not happening. Background checks are only happening in certain places. Patterson says a good way to have universal background checks is to have universal concealed handgun licenses and reciprocity between the states. Birdwell says restrictions put baggage on law-abiding, whereas those that are not law-abiding will not follow the rules created to deal with them. "There's no panacea for gun violence," Carusone says. She says there are little tweaks that can be made to improve the system. Patterson and Villalba are nodding. Rodriguez says the panelists should be in agreement that the state can impose reasonable regulations, including on things like high capacity magazines. When discussion turns to campus carry, Birdwell takes umbrage at any insinuation that concealed handgun license holders are a threat on campus. Villalba says "gun free zones" are the most dangerous places to be in the country. Carusone says that's not true. Patterson contends that if he had been in the Aurora, Colorado, shooting, fewer people would have died. Villalba discusses his bill that would have allowed for marshals in schools. Rodriguez says he voted against it because it would have introduced more guns into schools. "Would you rather your child have a fighting chance or not?" Villalba says. Root asks what the cause of all the gun violence is. Patterson says, generally, we're better off today than we were. Root notes that we're still more violent than the rest of the developing world. Patterson responds that we have a violent society. He says the growing problem is in venue shootings. "We don't have a gun problem," Patterson says. "We have a nut job problem." "What kind of society do we want to be?" Rodriguez asks. "Do we want to have everyone armed to the teeth everywhere?" Patterson and Birdwell both say, "Yes." Birdwell says he's comfortable with open carry, particularly in the Texas heat. But they need some other legislative successes on issues like campus carry before they get to that point. Robert Draper asks if Jerry Patterson is actually concerned about the government confiscating all firearms in the future. Patterson indicates that he is.